This Easter deliver something pretty that is sure to bring smiles! 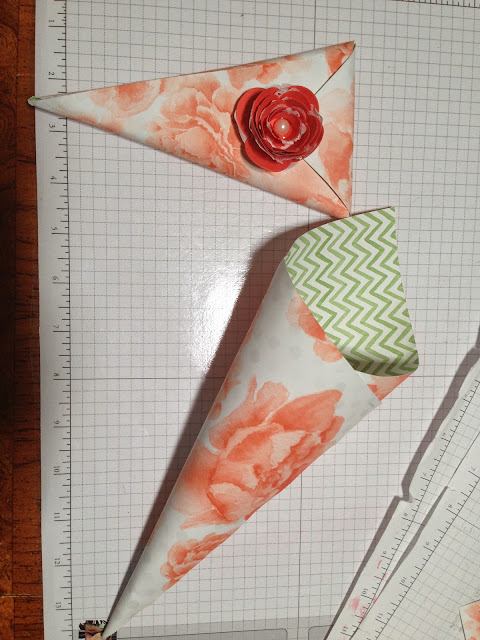 These pretty paper cones are a great way to celebrate outside of the typical basket. With a bold, colorful pattern and vintage design, this embodies Easter and the beauty of the Spring season. See this tutorial and feel free to share me, leave me a comment and let me know what you think! Start with a Square Cut piece of the Watercolor Wonder Designer Series Paper. There are three examples here, a 8", a 6" and a 4" square for a variety of sizes. Decide which of the patterns that you'd like for the exterior of the paper cone (our Designer Series Paper is DOUBLE SIDED - so have FUN creating and mixing your look, I'm creating these for an event at the church we will be attending for Easter). 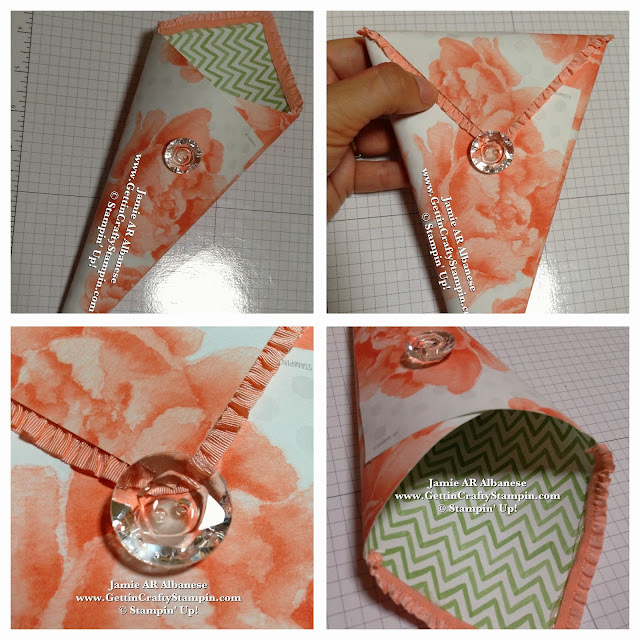 The pattern will color coordinate while wowing with an inner design, much like and envelope liner! 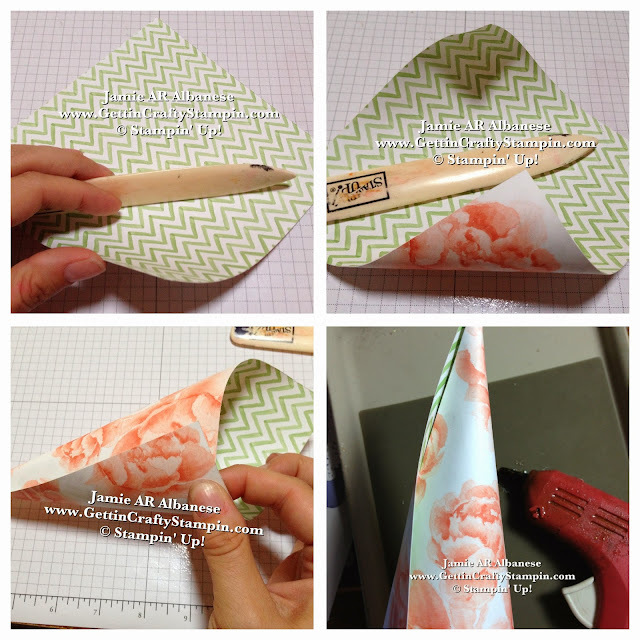 The secret to creating these cones is to use a bone folder to curl the edges like you see in the top of this tutorial. Pre-roll/curl both edges with the side of your bone folder. Curl and create the cone you desire. Apply one line of hot-glue on the exterior flap but inside a bit, this allows for an area that the hot glue can 'fill' with out pouring outside of the cone flap. I was demonstrating this project to a coordinator of a large event, I explained that if you are making many, break down the creating. Start by curling all of the papers with the bone folder. Then when that is completed curl and seal the flaps down. 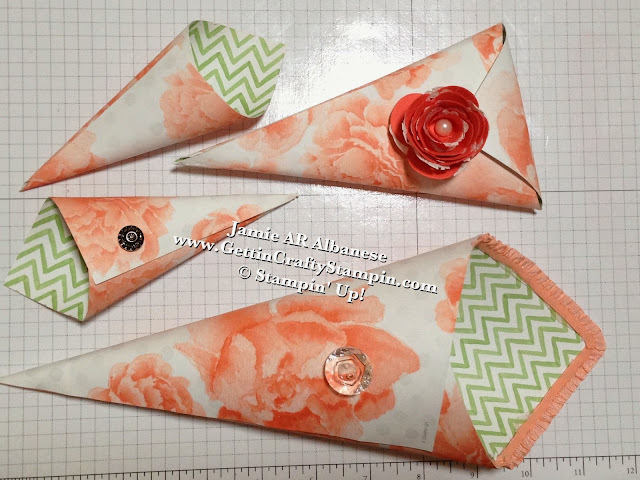 You will move quickly and much like your first pancake, the first one may not be your most beautiful.. but with practice and familiarity with the project you will create stunning paper cones and quickly! 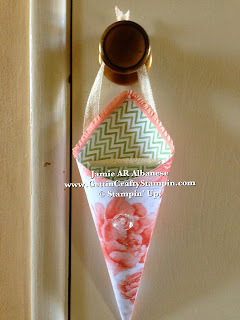 Create a flap holder when you embellish the cone with a button, rose, brad, etc. 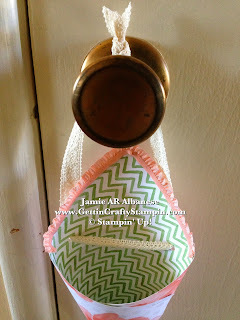 Here this In-Color Boutique Details embellishment in the Crisp Cantaloupe is hot glued on the bottom half alone - so that the flap can slip under and be held down. 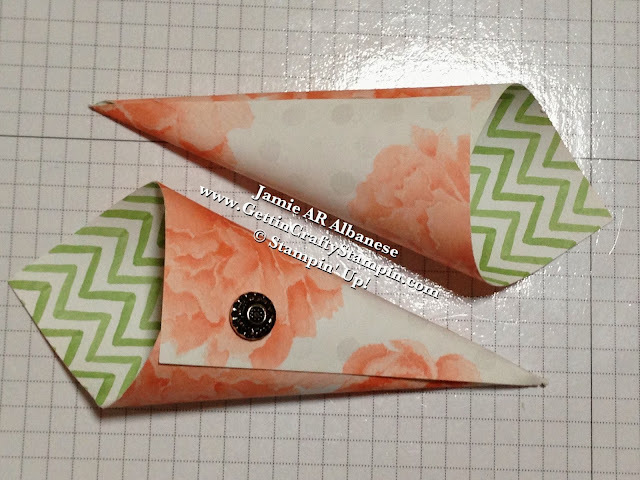 OK so I adore, yes - ADORE, the Spiral Flower Die!! IT creates these stunning 3D flowers out of do many materials! Here with the Spiral Flower Die and Big Shot, I created a Spiral flower out of the Tea Lace Doilies and Tangerine Tango. Layer them for this fun and funky, vintage vibe flower. I use Hot Glue to adhere the flower together. Apply a small bead of the Hot Glue to the finished rose and it will hold the bottom half to the paper cone, while allowing the top half to hold the flap down on the top. Add this adhesive Large Pearl to the center for more elegance. These adhesive backed pearls add a warmth and luster to the flower. 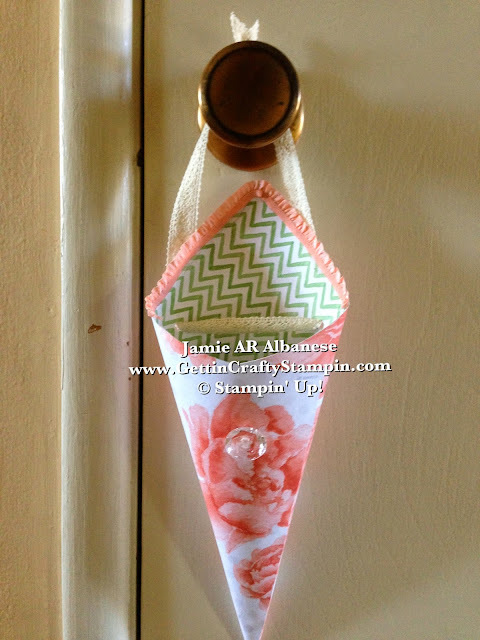 Applying the Crisp Cantaloupe Stretch Ruffle Trim to the inside flap of the larger paper cone is a fun way to add frill! Accented with the Vintage Faceted Designer Button to hold down the flap, this sparkles and would be great for a bridal or baby shower, a girly party and more! Have fun mixing textures and adding elegance with a variety of accents. This 4" square is my smallest of the cones and my kids couldn't resist stealing one for their own play time! These are super cute, delicate and deliver a small treat that is sure to delight. Accented on this cone is the Antique Brad. I adore the vintage elegant vibe. It makes for a luxurious looking cone. These would be ideal for a flower girl or guests to a wedding - fill it with seeds or rose petals for a pretty showering of love on the newlyweds! Decorate your home, surprise family, friends or neighbors with this door hanger! 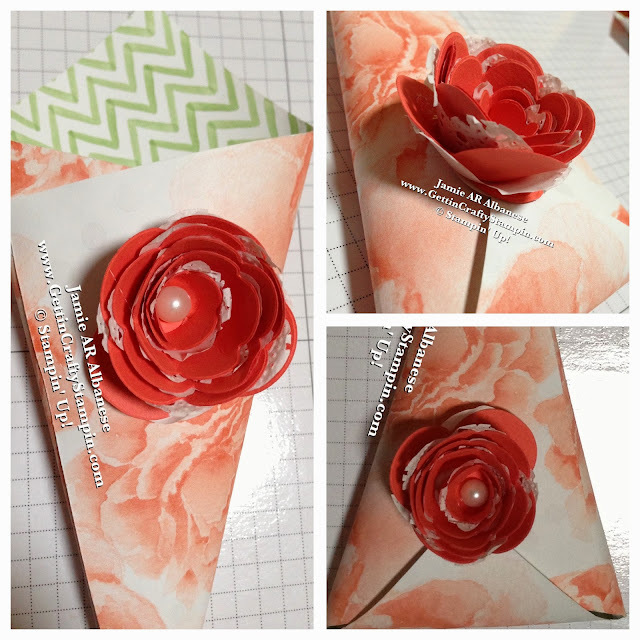 Fill with fresh or fake flowers, create paper flowers with the Spiral Flower Die and wow! 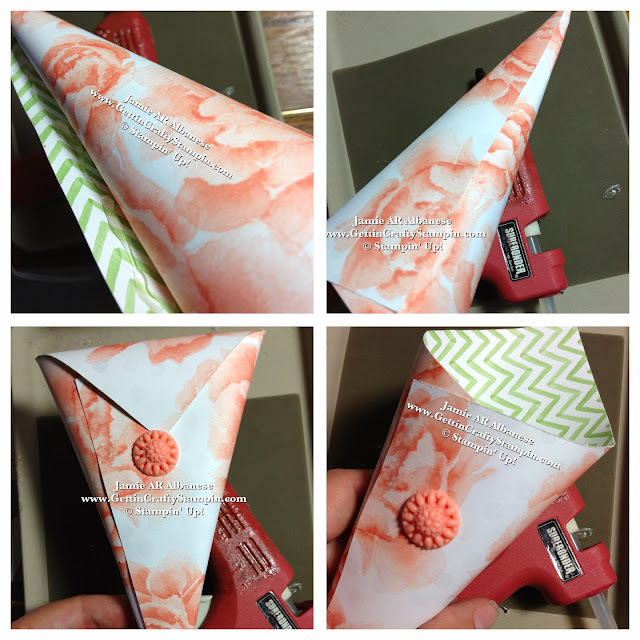 No matter how you embellish this paper-cone, you are sure to have a BLAST creating and delivering smiles! I hope that you enjoyed this paper cone tutorial. Change it up this Easter (or May Day or Mother's Day) and fill a basket full of these cones! You can use these beautiful cones and fill with jewelry, small candles or (yumm) candy (chocolates, jelly beans, favorite candies, etc). Use these for weddings, parties or just to delight! Please feel free to Share Me and this tutorial with your friends and family!